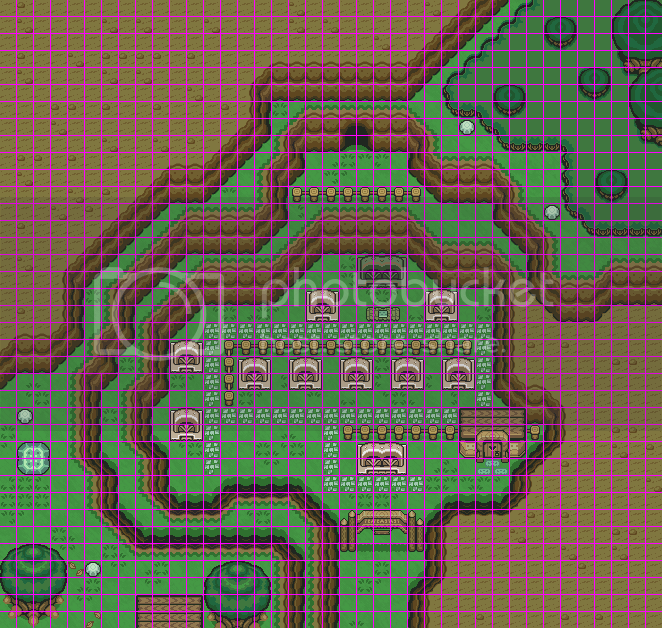 Well as many of you know I have spent the majority of my time here mapping and really just creating sprites which might be of use to an OOT2D project (the reason most of the oldschool members came here in the first place). I have been looking at the map which I now have, with all of the areas which I have created and come to the conclusion I am over half way through. What with the holidays starting now and me having nothing to do, I thought I might make a project out of it and see what I could get done. I have created this with several things in mind, firstly the maps must be as true to the original as possible. Secondly they must fit into the LTTP / FSA style, and thirdly they must piece together correctly (even though the original OOT map failed at this). Desert Colossus - Needs new sprites, but mapping finished. Some of the links went down. I have replaced them. Hopefully these will last a little better. I'm still going to keep working on sprite updates and layout updates so keep the criticism coming so I can improve this further! I am opening this project to the public. I want anyone who can to submit sprite suggestions to replace what I already have. I will of course ultimately be deciding which sprites get into the project itself. I also welcome suggestions to re-do any areas in ways which might make them more playable. For now I am not looking for any new areas (such as inside dungeons) as I am in the process of mapping those out myself. If anyone fancies making some sprites for the inside of the Greak Deku Tree for me I would be most impressed. 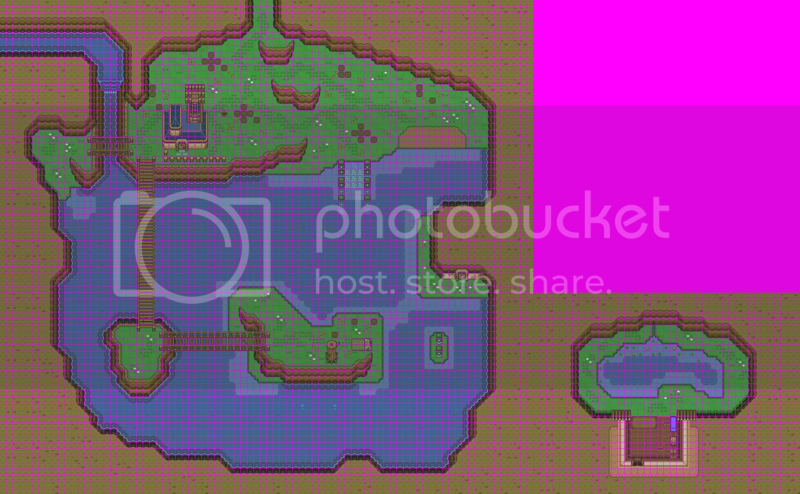 I have already mapped the entire area out, I just lack the sprites for it. I am going to be very busy with exams this week and the next two. So I will only be posting big updates here around once a week. I'm sure I can pick up again after that. The section below is a list of credits to people who have contributed to the project and whose sprites I have either added, or will be adding to the project itself. Skeme KOS - Gravestone sprites in the Graveyard, dirt paches for magic beans. Master Yoshi - Temple of Time in Hyrule Castle Market. You've been doing an excellent job with these maps, I'm really fond of your work. I haven't got any real criticism, apart from the Hyrule Market map, maybe the alley needs some work, namely the house on the top left part of the alley. Perhaps the door of the house should be put a little more to the right? Otherwise excellent job, keep it up! I'll see what I can do for those Gerudo Valley screenshots. Good work, my good sir! I thought the alley needed a little bit more work too, but I couldn't think of what I could actually do with it to improve upon it, if you have any suggestions I would be glad to hear them. I will be moving the door slightly to the right as you have suggested. 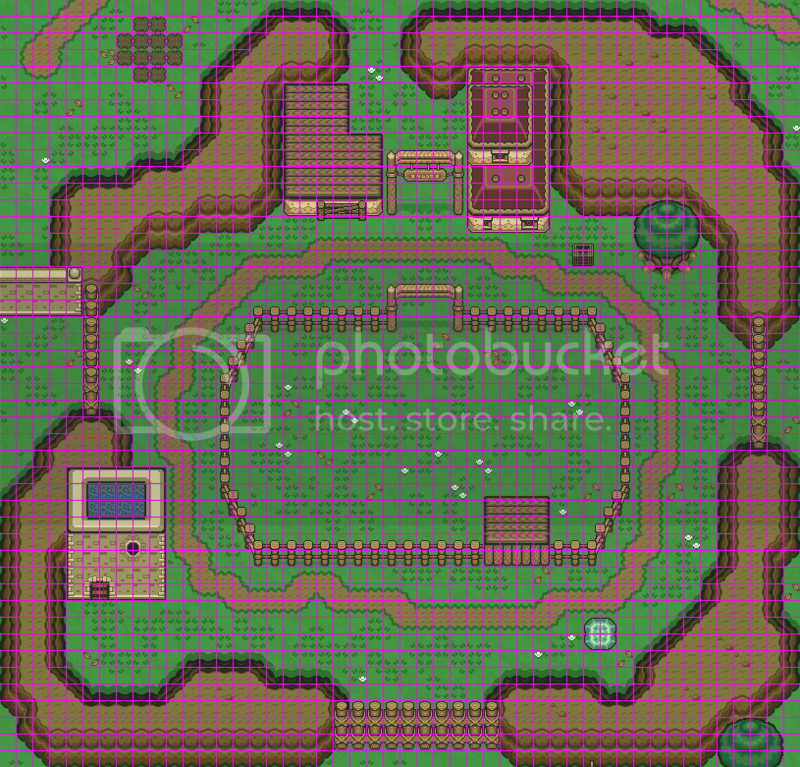 As for the tree, I agree with you, however I am attempting to create this entire map with sprites either created / edited by either me or Nintendo. I might improve upon my tree, but if someone wishes to use a better tree they will have to edit it themselves. I understand you are only willing to use your own work, that's what makes this project even greater. Attached are some shots of the entrance to the Gerudo Valley, in young Link's form as well as adult. Tell me if you need more. You are going to work on your Temple of Time though right? I still think it's epic. Also, HOLY CRAP IT'S AleX_XelA! Whoa. I never realized you did so many of the areas. Great job man. Hopefully someone implements those in an OoT2D remake, because so far it's looking great. There are some minor flaws, but the whole picture is really neat. EDIT: OH, AND HI ALEX! Death Mountain Trail: At the top there is a stairs that ends in the middle of the cliff face. Not to mention it is partly free of the surface, because it is on a corner. If you take a look at the perspective lines. It does not look right. Zora's Fountain: At the top there just needs to be one more cave. It is missing. Castle Town: I love the Temple of Time area. The castle town market however has to much grass. The edge of the pavement has to follow the blue lines next to the buildings. In addition the tree and the waterpool should be moved more to the center, in order for people to walk around it. That way the market square actually has more of an idea of a square and the back alley the idea of a back alley. 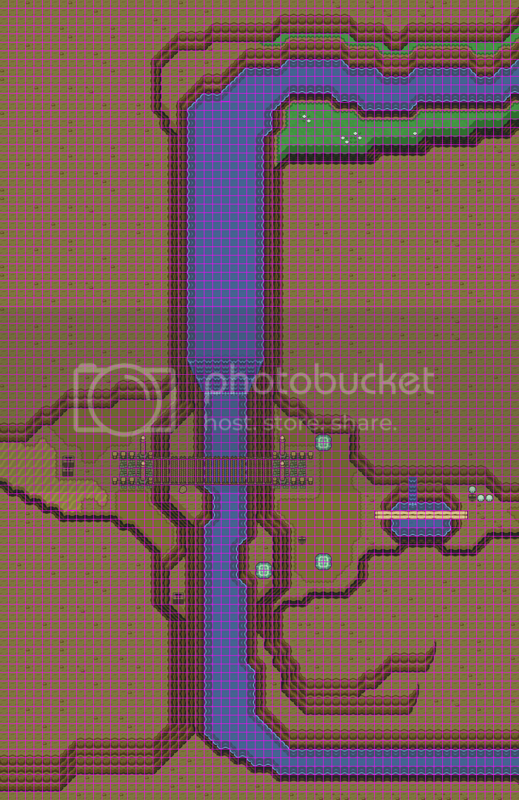 Hyrule Castle: Near the Castle area, the area to the right could use a bit more of the pavement you have used below. At the draw bridge it would look a lot better if there was an actual closed door or draw bridge. Now there is a wide open gap without a way to reach there. It does not look like a main entrance of the castle. The pavement leading up to the drawbridge should actually be like the pavement you have used near the door. Once more signifying that, that is the main entrance. Lastly the entrance Link has to use to get to the garden looks pretty, but it is nowhere near practical. Oh yeah what happened to the bottom of the trees? Firstly, I would like to say I agree with everyone about the pink lines, it gives me a headache just looking at them after a while. The issue is I needed a colour which wasn't going to be used by the tiles to clearly separate them, and white can't do this, especially for the castle areas. As for the castle itself, I agree entirely about the impracticalities about using the entrance I have made. I am considering having a pull switch that lowers the water so you can walk straight up into the section the water comes from, but that wouldn't be true to OOT itself so I am not sure what to do with that. As for the type of ground I have used there, you are right, and I will be changing that shortly. The drawbridge I will be putting in, I have just yet to sprite, it takes quite a while to sprite something like that for me as my area of expertise is mapping, not spriting. I will be having an attempt at it however. Any more criticisms are more than welcome, so please keep them coming. The changes make the maps look a lot better. Good work. As for the castle itself, I agree entirely about the impracticalities about using the entrance I have made. I am considering having a pull switch that lowers the water so you can walk straight up into the section the water comes from, but that wouldn't be true to OOT itself so I am not sure what to do with that. My advice would be to stay a bit more true to OOT. In OOT Link has to push a block on a small plateau in the moat. Making a platform high enough and a gap small enough to jump over. In a 2D variation, you can still use the block. On both sides of the moat are half arches, that signify a possibility of a bridge. Link can then push a block in between the arches to complete the bridge. And because it are arches it is still believable that water is flowing under the bridge. Or something like that. I might go with the arch idea, though it won't be until a little later when I have completed a few more areas. This is of the child area, so the tent is not there. I am also aware of the fact there are two waterfalls in OOT in this area. my issue is I could not have made it in a way which would have correctly connected to Lake Hylia if I had a second. As usual, criticisms are welcome. 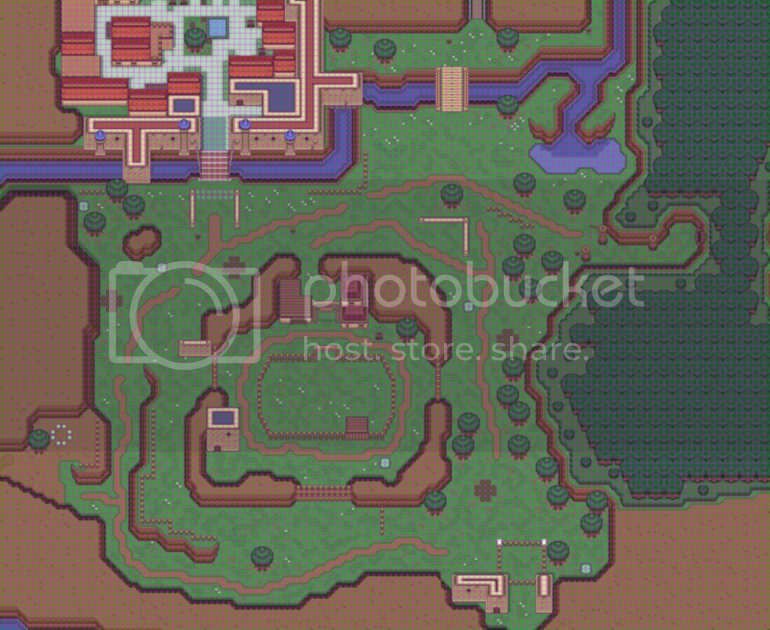 Also, if anyone can, I would appreciate pictures of all the areas in the lost woods, as well as the Gerudo Fortress, I will be moving on to those next. My issue comes with the Lost Woods though. I do not have wooden tunnels which go horizontal, and making them seems to be tricky. Hopefully I will sort it soon though. For the Lost Woods Wooden tunnels I think you can rotate them 90o. I don't think that would look bad. Not much to say regarding the Gerudo Valley, since you said you can't have multiple waterfalls. However I think the small waterfall that fills the pool should only be one tile wide. I was wondering though, are you going to make the hidden spot, behind the big waterfall, slightly visible? There's a ladder that allows Link to climb up there. 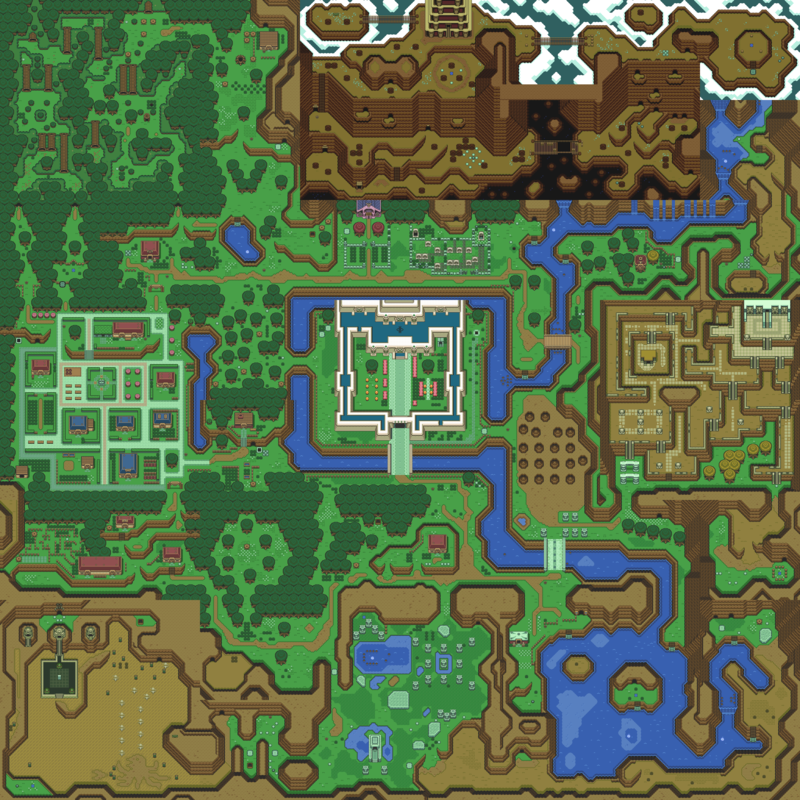 This project is really getting great, I just hope the final overworld map ends up as big, if not bigger, than the ALTTP map. I always felt OoT's world to be bigger than ALTTP's. Thanks very much for the images. As for the area behind the waterfall, I was actually not aware it existed. That would be something quite major to miss out so I will have to look into it. I agree with the one tile wide for the pool area waterfall, that is what I originally did, but for some reason it doesn't look right as only one tile, so I changed it. Do you think that should go back to just a single tile then? As for as big / bigger. Just to put it into perspective, my current map is 5864 * 4600. 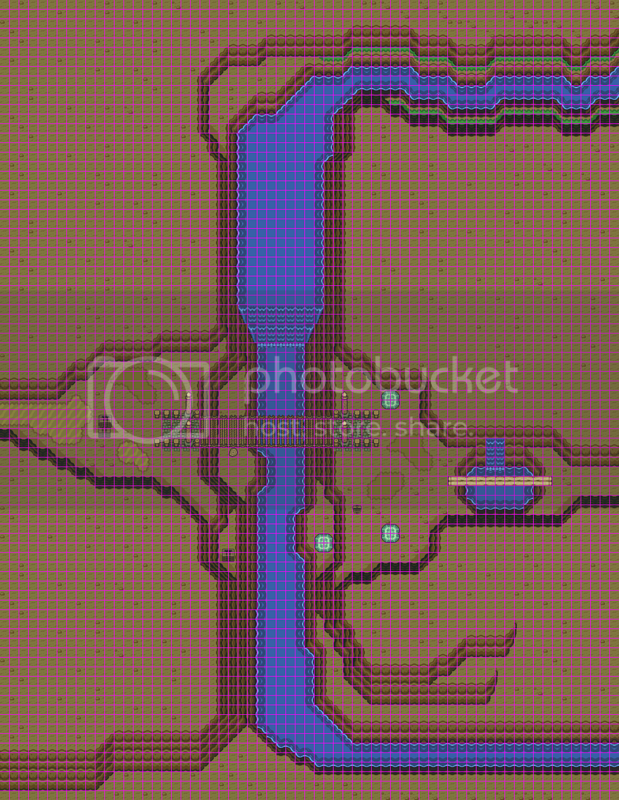 The LTTP map is 4096*4096. 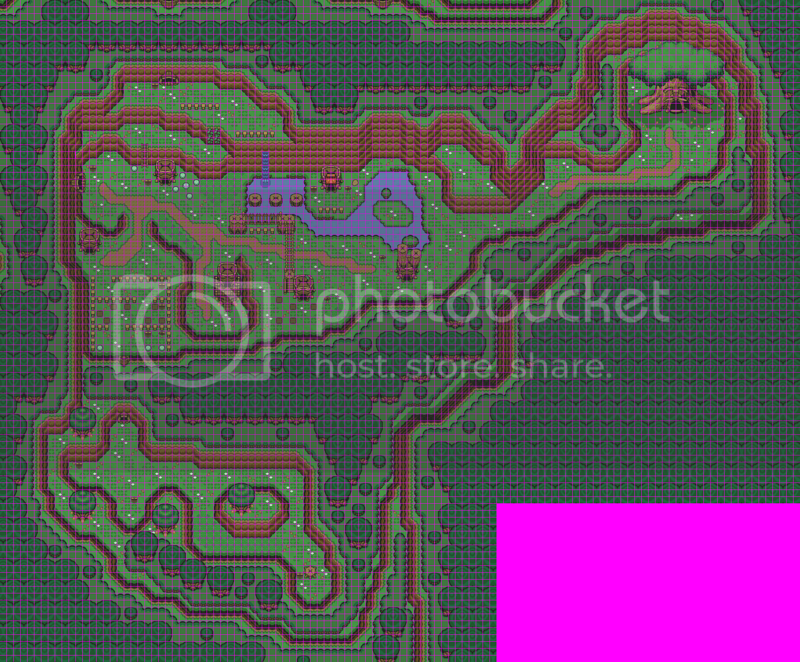 Granted I have loads of lines between every 16*16 tile, but this map when finished and compressed with definitely exceed that of LTTP's. Hmm, still really monotonous brown. Just a crazy suggestion and it will be quite some work, but try to make the entire area where Link can walk (with the exception of the lower parts near the river) into the yellow/brown floor of LttP death mountain. And leave the desert tiles more to the area with the Gerudo foretress. One thing though, at the entrance of this area are a sign post and three small rocks. Hmm, I have been looking at the complete map. 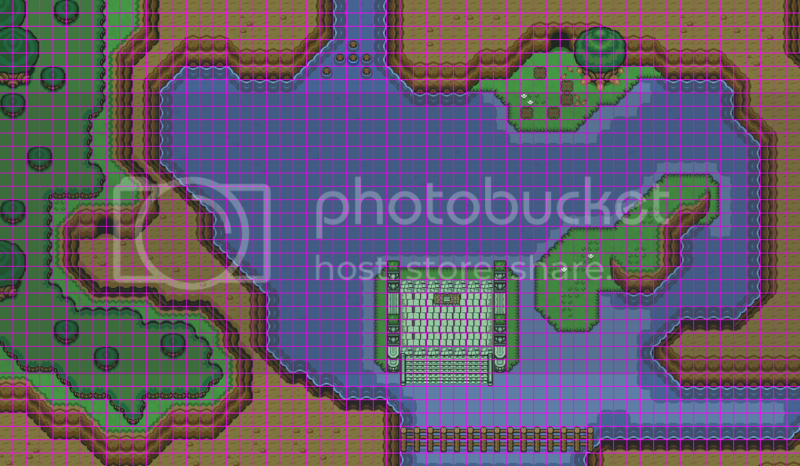 Even if it is bigger than the LttP map, it still has a lot of unused space. In LttP every bit of tile was used and used in a usefull manner. If someone would make a OOT2D he or she would have a lot of additional space to add a lot of additional content. Also one more thing. Kokiri Forest looks rather big compared to the rest. Ok, so we now have a single waterfall, a sign, and three small rocks, thanks for the heads up on those. I am currently working on the colours so when that is done I will post it all together. I agree entirely with the unused space, for the most part it is surrounding the areas, and to be honest I wouldn't have a clue what to do with them aside from adding new areas all together. The issue with tiling is everything must be square really, and in OOT it isn't, so you end up with loads of blank areas for a boarder. As for Kokiri forest I agree entirely, far too big. I will be redoing it as mentioned, just after I finish the lost woods which I am working on. Though how small I could make it I do not know, as it is actually a very busy area. 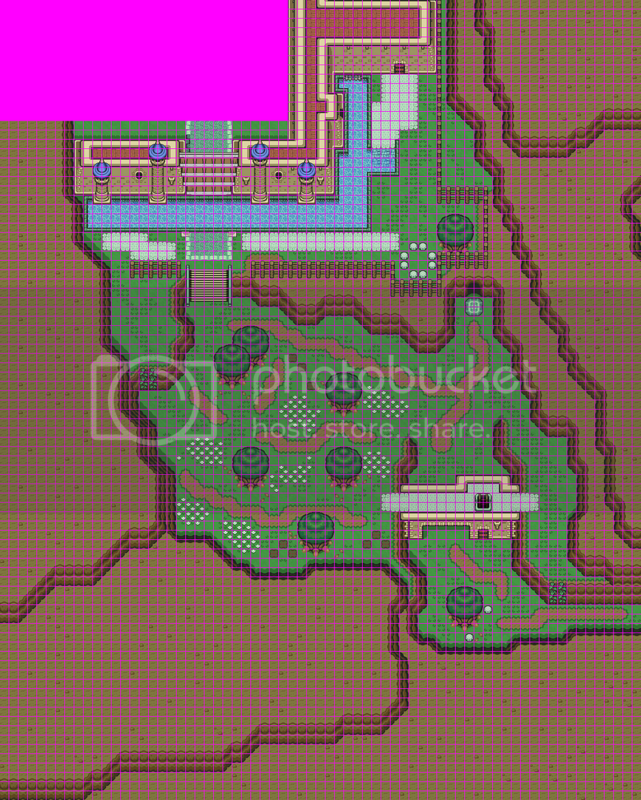 As for the LTTP map, there are areas which would have been pointless space, but they have cropped them so the map doesn't work correctly. To see this you only have to go to the east in lake hylia, or the north of the castle.